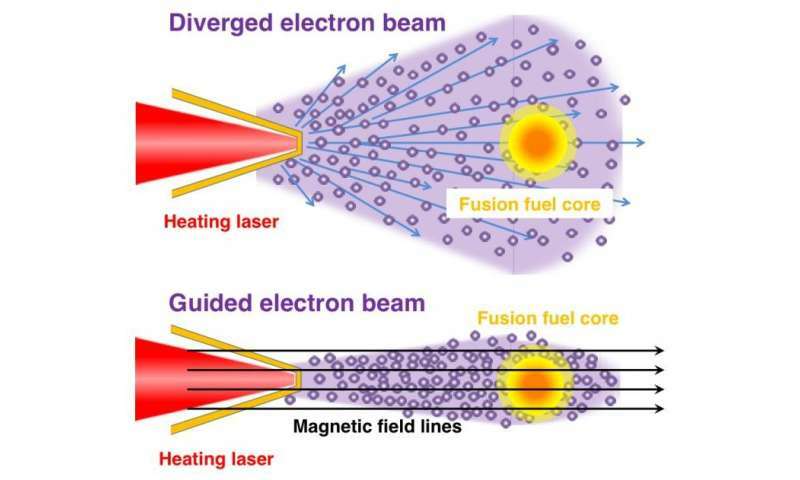 An international joint research group led by Osaka University demonstrated that it was possible to efficiently heat plasma by focusing a relativistic electron beam (REB) accelerated by a high-intensity, short-pulse laser with the application of a magnetic field of 600 tesla (T), about 600 times greater than the magnetic energy of a neodymium magnet (the strongest permanent magnet). Their research results were published in Nature Communications. If matter can be heated to temperatures of tens of millions of degrees using REB accelerated to nearly the speed of light by irradiating plasma with high-intensity lasers, it will become possible to ignite controlled nuclear fusion reactions. In the central ignition scheme, a prevailing scheme for inertial confinement fusion (ICF), has the problem of ignition quench, which is caused by the hot spark mixing with the surrounding cold fuel. On the other hand, in the fast ignition scheme (fast isochoric heating), a portion of low temperature fuel is heated, and then the heated region becomes the hot spark to trigger ignition before said mixing occurs. Thus, the fast ignition scheme has drawn attention as an alternative scheme. A kilo-tesla level magnetic field is necessary to guide high-energy electrons at the speed of light, so the researchers employed magnetic fields of several hundreds of tesla. Because electrons, which are charged and have a small mass, easily move along a magnetic field line, they guided the high energy REB of 1MeV along the magnetic field lines to the core (the fusion fuel of 100 microns or less), achieving efficient heating of high-density plasma. They called the scheme magnetized fast isochoric heating. In this study, laser-to-core energy coupling reached a maximum of 8 percent. The laser-to-core energy coupling, i.e., the energy deposition rate of REB, depends on the density of the plasma to be heated. In calculation based on the ignition spark formation conditions, the energy deposition rate of REB obtained in this study is several times more than that obtained by the central ignition scheme. Thus, the researchers conclude that the magnetized fast isochoric heating is very efficient and useful for the development of laser fusion energy. 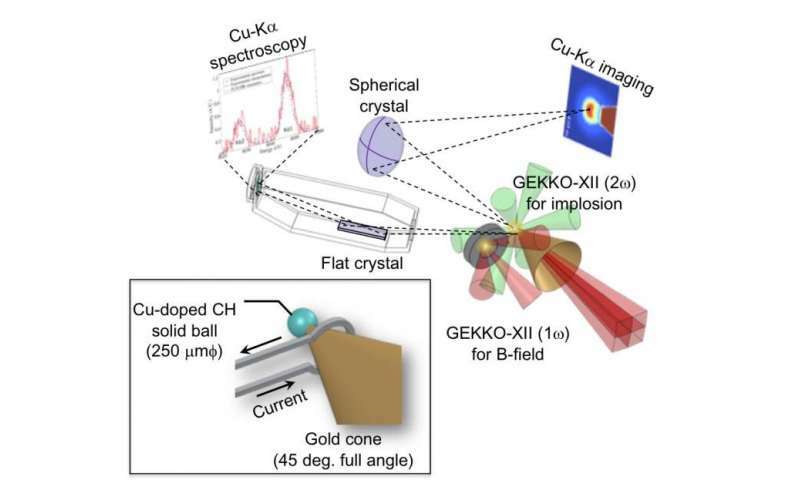 Senior author Shinsuke Fujioka says, "We have made progress towards the realization of laser fusion energy in cooperation with researchers from home and abroad under the Joint Use/Research Center Project. Our research results will be applied to studies on the reproduction of the core of a star in laboratory simulation and the creation of new matter under extreme environments." The article, "Magnetized Fast Isochoric Laser Heating for Efficient Creation of Ultra-High-Energy-Density States," was published in Nature Communications. This is great! We are getting close to fusion and the start of a utopia. Enough cheap energy to desalinate water to irrigate the deserts for food. Enough cheap energy to give third world countries energy for refrigeration, lighting and air conditioning, internet connectivity(computers, cell phones) etc. What % of our income goes for heating, cooling, cooking, lighting in our homes? "We are getting close to fusion and the start of a utopia." An energy utopia should have come about with the creation of nuclear fission, "too cheap to meter" was the promise. What happened?? What happened was we found out the bad side of fission since it was developed for the military. Then it was 'not in my backyard' by the locals. Plus the use of cheap materials, accidents, cost overruns, and environmental concerns practically killed the dream. The high density beam heats anything it strikes. Ignition, using it conversationally, does not make any sense, to me. Implosion would be unique, that is crowding multiple centers within a volume to a smaller volume then stabilize, is very difficult. Displaying the smaller as stable, i.e. fusion is not shown. I'm trying to visualize this and am having difficulty with the spherical fields produced. If contained during this action, no "light" or "radiation" will be observed. If the laser only oscillates the centers very rapidly, yeah, I can see this; but, dude, ya off base. By the way, Nature publishes a lot of Bull$hit w/o correction. Not saying they get paid; but, no way are we this stupid. Fission is EXPENSIVE! And potentially deadly for a lot of people now and in the future generations. And just out of curiosity I wonder how much insurance is, seeing as how we could destroy a large amount of land for over 100,000 years. And that's not counting deaths etc. This REB scheme looks like it is a winner. But it is still early and too soon to tell. I don't think irrigating the deserts to grow food is a good idea. Some of the deserts like the Sahara were once inland seas until they dried up due to natural causes. It is best to try to contain the deserts so that the sands don't overcome or overwhelm populated areas where there is vegetation and water sources. The winds blow sand from the Sahara to places like European nations. This brings new material to mix with the soil already there. It's not always a good idea to mess with Nature. You just never know what you're going to get back. There used to be jokes going around that the effects from the radioactive fissionable material would cause you to glow in the dark. IIRC pure Unanium 235 or 238 is too highly radioactive and is only good in atomic bombs, and possibly for medical uses - but not good as an energy source for domestic use to make electricity. Thorium molten salt fission reactors are SAFE and effective. Proven at Oak Ridge in the 60's. This fission process was ignored because it doesn't produce nuclear weapons grade waste to use for nukes. "Thorium molten salt fission reactors are SAFE and effective. Proven at Oak Ridge in the 60's. " Quote from wikipedia "Molten Salt Reactors used to be "expensive, required highly enriched fuel, and had a low power density","
Quote from http://www.transa...science/ "Waste less than half of Water Reactors"
If terrorist strike MFR they can get there hands on VERY dangerous material. If earthquake or explosion happens it could release some VERY dangerous material. None of these problems with fusion reactors. rderkis, I would agree with your comments in general. Except for your ending. I think it would be more accurate to say: "We do not yet understand what can go wrong with fusion power production. This would be a good rime to try & figure out what could go wrong. Hopefully to prevent failures?" Let's not wait until there is a swarm of people running past us. Screaming loudly! The way this article was written, headlined, and edited. At first glance? There should be public celebrations for these researchers accomplishing fusion power? While back and forth the verbiage sloshes. Careful deciphering of possible methods speculated, leaves me believing that this research team has achieved another rung on the ladder to fusion power. But it is still a very tall ladder with many rungs still to be climbed before we hold a victory parade for anyone. One minor detail? The need for more powerful magnets? By an order of 60 magnitude? Fell free to correct my confusion. I am not a nuclear physicist so I am forced to believe all the experts that say "fussion presents no dangers like fission". But I realize that these are not facts but rather theories and unforeseen things can go wrong. I will not hold back a technology that could feed and shelter the world because some unforeseen even MIGHT happen. As far as this achievement/breakthru making fusion possible, I do not think they are claiming that. But rather this COULD put us close to or over the top when it comes to breaking even with fusion energy. shouldnt they be using a beam of protons instead? more mass= more heat capacity. "shouldnt they be using a beam of protons instead? more mass= more heat capacity." I don't believe that is plausible due to the mass differential between the 2 particles.